The Apple Watch Series 4 is officially available for purchase, and it comes packed with not only a larger display, but a bunch of additional health features, including a built-in electric heart rate sensor. It also comes in two different case sizes: A 40mm model and 44mm model. Aside from the Apple store, the company’s next-generation smartwatch is available in other locations as well. In fact, now that pre-orders are over, the watch will be available from a number of stores, both online and in-person. The Apple Watch Series 4 is currently available for order in the U.S. through Apple’s site, the Apple Store app, and physical Apple Stores. For those not in the U.S., global availability on the Series 4 varies — but Apple has listed the countries on its website. As for pricing, the Series 4 with cellular connectivity starts at $ 499. If you opt for the Series 4 without cellular connectivity and just built-in GPS, it starts at $ 399. It’s important to note that cost not only varies depending on whether you choose to have network connectivity, but also depending on which color variant and case size you purchase. Best Buy is also selling the Apple Watch Series 4 both online and in-store, and at the same price as Apple. For those interested in checking out the watch before they buy it, Best Buy may be a good option. All four major carriers have confirmed the Apple Watch Series 4 is available on its networks — and you can now order the device from each. Each carrier varies when it comes to the availability of styles and color variants of the Series 4. On Verizon, the Series 4 starts at $ 83.33 per month for six months for the 40mm space grey aluminum case with a black band, gold aluminum case with a pink sand band, or silver aluminum case with a white band. The same color options are available for the 44mm model, but it’ll cost a little extra — $ 88.33. Of course, you’ll need to pay a monthly fee for cellular connectivity, and adding an Apple Watch to your plan costs $ 10 per month through Verizon. At T-Mobile, the 40mm aluminum Series 4 and stainless steel options cost $ 20.83 per month and $ 22 per month, respectively. While the aluminum model doesn’t require a down payment, you’ll have to put down $ 172 for the 40mm stainless steel version. As for the 44mm versions, the aluminum costs $ 22.08 per month and the stainless steel version is $ 22 per month. The 44mm stainless steel model is $ 0 down while the 44mm stainless steel version requires $ 222 down. Like Verizon, adding a cellular Apple Watch on T-Mobile requires a monthly fee, which is $ 10 per month. The Series 4 is also available for purchase on U.S. Cellular. If you purchase the smartwatch on the carrier’s Total Plans with no Hidden Fees plan, the company will waive the $ 10 monthly service charge. If not, then you’ll be charged $ 5 per month with the first three months free. At Sprint, the 40mm gold aluminum case with a pink band, silver aluminum case with a fog band, and gray aluminum case with a black band each cost $ 20.84 per month for 24 months. The 44mm version of those color variants comes out to $ 22.09 per month for 24 months. There’s also no down payment required. On Sprint, the monthly fee is $ 10 per month. For the 40mm gold stainless steel case with a stone sport band, it’ll cost $ 35 per month through AT&T. 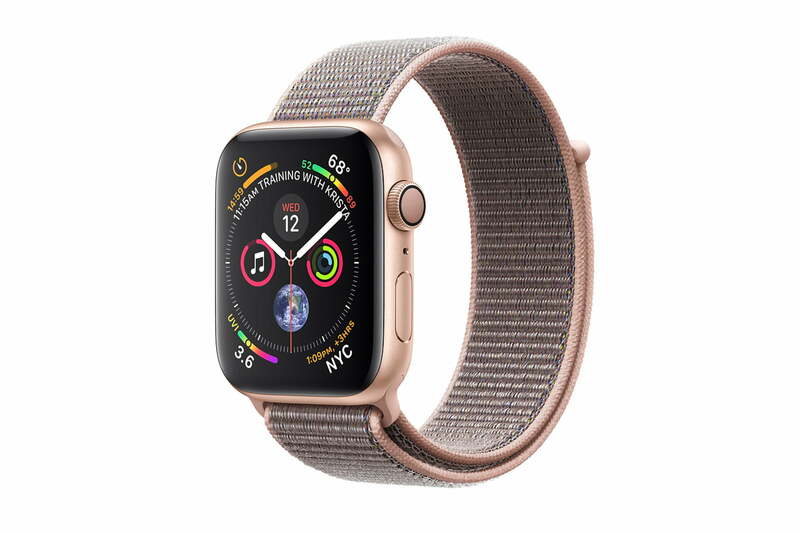 The 40mm silver aluminum case with a white sport band, silver aluminum case with a seashell sport loop, gold aluminum case with a pink sand sport loop, gold aluminum case with pink sand sport band, or the space graey aluminum case with a black sport band will each cost $ 25 per month for a 20-month installment agreement. As for the 44mm Series 4, the space black stainless steel case with a black Milanese strap is $ 42.50 per month with a 20-month installment plan. The space black stainless steel case with a black sport band, gold stainless steel case with a stone sport band, and stainless steel case with a white sport band are each $ 37.50 per month for 20 months. Meanwhile, the silver aluminum case with white sport band, silver aluminum case with a seashell sport loop, gold aluminum with a pink sand sport loop, and space grey aluminum with a black sport band or black sport loop are $ 26.50 per month for 20 months. The monthly fee for cellular watches on AT&T is $ 10 per month. Updated on September 21, 2018: The Apple Watch Series 4 is now available.